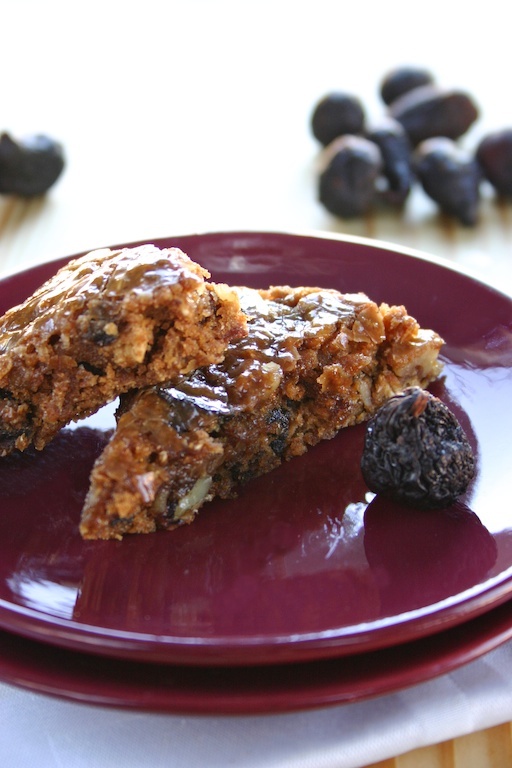 Inspired by the famous figgy pudding beloved by the Brits, these brandy-glazed bars are chock-full of figs and flavored with pumpkin-pie spices. These bars are incredibly moist and tender, although slightly difficult to cut. So if you’re looking for nice clean edges, place the baking sheets in the refrigerator over night, this makes slicing a little less messy. Prepare Figgy Bars: Preheat oven to 350°F. Spray two 13″ by 9″ baking pans with nonstick cooking spray. Line pans with parchment paper, extending paper 2 inches over short sides of pans; coat paper lightly with spray. In 4-quart saucepan, combine figs and water; heat to boiling over high heat. Remove saucepan from heat; stir in oats. Stir sugar, molasses, and Earth Balance into fig mixture until blended. Stir in applesauce. Add flour, wheat germ, pumpkin-pie spice, salt, baking soda, and baking powder, and stir until combined. Stir in walnuts. Divide batter equally between prepared pans; spread evenly. Bake until toothpick inserted in center comes out clean, 23 to 26 minutes. Cool in pans on wire racks 10 minutes. Meanwhile, prepare Hard Sauce Glaze: In small bowl, stir confectioners’ sugar, brandy, vanilla, and water until blended. Remove bars from pans by lifting edges of foil; transfer on foil to racks. Brush hot pastries with glaze. Cool completely. When cool, cut each lengthwise into 4 strips, then cut each strip crosswise into 6 rectangles. Cut each rectangle diagonally in half to make 96 triangles. Store in tightly sealed container, with waxed paper between layers, at room temperature up to 1 week or in refrigerator up to 1 month. Combine spices in a small bowl mix thoroughly to combine. Store in an air tight container in a cool, dry place for up to 6 months. That recipe looks great. Where do you find wheat germ? Love the blog! Thanks for posting! Thanks, I buy (Bob’s Red Mill) at the supermarket. Most of them carry it. Sometimes they keep it with the baking items, other times its in the health food or bulk section. Stores that sell food and dry goods in bulk usually carry it as well, as do health food stores and co-ops.